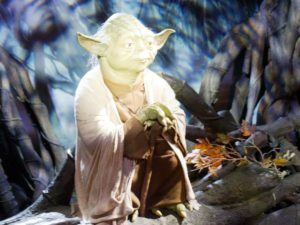 As Star Wars blasted off across the planet, and the word grew that this was something very special indeed, marketing departments scrambled to get Star Wars products out of the factories and onto shelves as fast as possible. With action figures taking 12 – 15 months to design and sculpt there was a big – a very big – gap that needed to be filled. Here in the UK it wasn’t quite the problem that it was in the States. With the film not arriving here until December 27th 1977 and not rolling out nationwide until the spring of ’78, the gap between the viewing of the film and the arrival of the toys was far less. By March 1978, Palitoy began to roll out their products. Great news for UK kids, and those 12 original figures were soon sweeping across the country. In addition, licensees were smart enough to be designing and releasing products that were quick to design and produce. These ‘easy win’ products hit the market, giving fans the chance to own a small piece of the film. Among those early products was stationary which predominantly targeted schoolkids. The Helix brand was launched in 1894 and was known originally as The Universal Woodworking Company. By 1960 the company was known as Helix International Ltd and stepping forward to 1977 and Helix was snaffling up smaller companies before taking a gamble on the Star Wars licence. Bringing a range products to market in early March ’78, vinyl and wooden pencil cases, rulers, pencils, maths, school and pencil sets, erasers and die-cut erasers soon began to appear nationwide. Highly valued today, many of these products are tough to find and much sought after. For instance, the iconic Death Star pencil sharpener. The appearance of this in Steve Sansweets From Concept, to Screen to Collectables elevated this from a nice-to-have to a must-own item and the price for this sharpener has risen in the intervening years. The sharpener was initially a plain grey sphere, much like the actual station, but the machine which tooled it was set up to produce a multicolour sharpener and thus the vivid Death Star sharpener was born. Helix also dipped into the eraser market (or RUBBERS as I wanted to call them in my blog on the official site, before my American editor changed it to ERASERS – killjoys!) 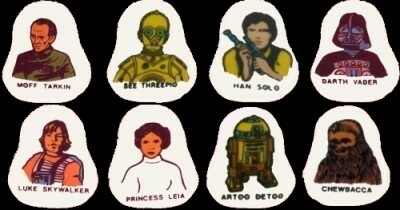 The first release brought kids a series of 8 flat erasers comprising of C-3PO, R2-D2, Chewbacca, Darth Vader, Han Solo, Luke in his X-Wing outfit, Princess Leia and Grand Moff Tarkin. Just think, nearly forty years later five of those characters appeared in Rogue One with another two set to appear in the Han Solo standalone in 2018. Along with obvious products like posters and iron-on t-shirt transfers a range of dry transfer sets were released. That company was Letraset, based in Ashford in Kent. Starting in 1959, Letraset manufactured typeface for a variety of products, a valued commodity in those pre-computer days. In the 60’s they brought dry transfers to Action Transfers and began purchasing licences in the 70’s including DC Superheroes, The Rescuers and the uber-licence, Star Wars. They appeared on the back of Shreddies cereal boxes in a range of four scenes (Capture of the Rebel Cruiser, Escape from Mos Eisley, Breakout at Prison Block and Escape from the Death Star) before being released in their own sets. The first range included three sets (Battle at Mos Eisley, Escape from the Death Star and Rebel Air Attack) and expanded to include another 10 sets which ran through the events of the film in chronological order. 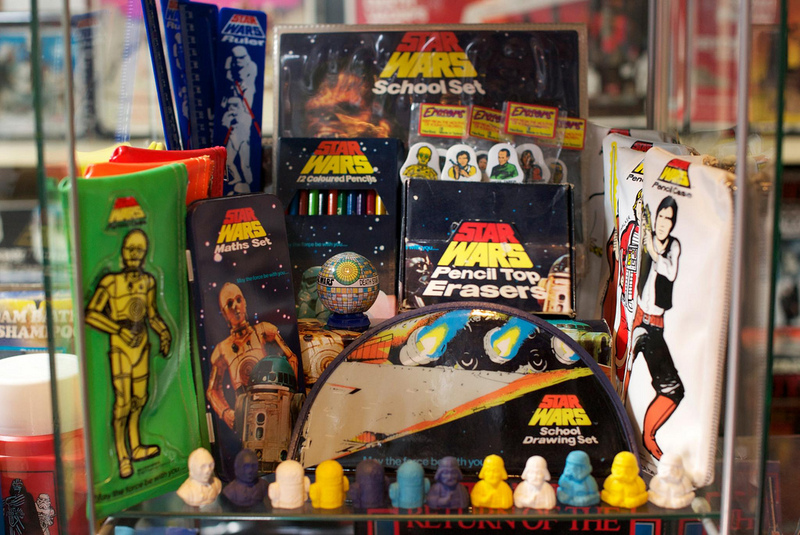 These items along with a swathe of unlicensed products including the infamous Force Beam, a blatant Star Wars knock off which, believe it or not, was advertised on the back page of the officially licensed, kept kids and collectors busy until the wider range of Palitoy products kicked in. And boy, when those got traction they sold in their droves. By then the weekly comic was a fixture on newsagents shelves, the poster magazines were well into their run, the novelisation was selling out and hitting second and third printings and the double album was well on its way to breaking records for orchestral soundtrack sales. Splinter of the Minds Eye was released in the States on 1st March 1978 in hardback, April 1st in paperback and arrived here in the UK via Sphere with a slightly adjusted cover (the classic yellow surround much like the Sphere print of the original movie adaptation. 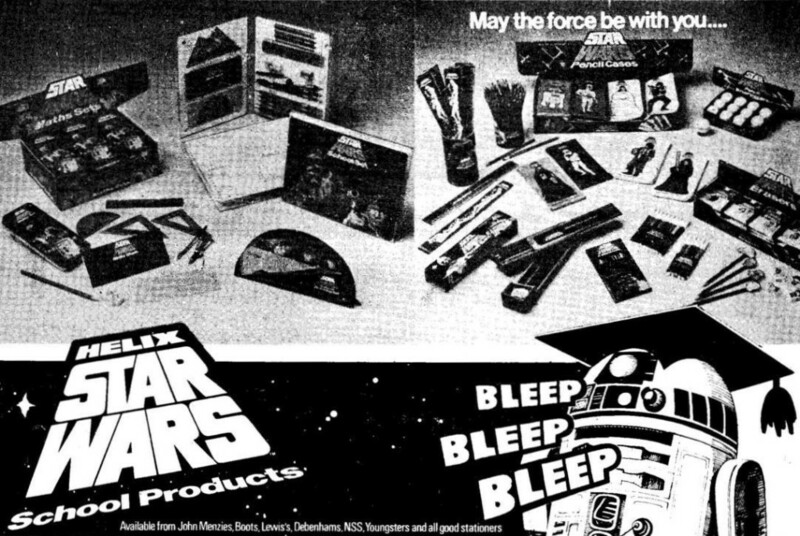 That and the evolving range of products that was hitting stores faster and faster only served to solidify the excited fan base and prime them for the arrival in 1980 of the next chapter, The Empire Strikes Back.